In Canada we say there is no bad weather, just bad clothes. Even dressed in our best Canadian foul weather gear it was tough this past week. How tough? One day we froze 3 reels solid while casting. The reels froze, the rods froze in the rod holders, the water pump on my Merc was frozen when we started, the boat was frozen on the trailer, the windshield became covered in ice early on and never cleared up………. got the picture? So why do we still go out? 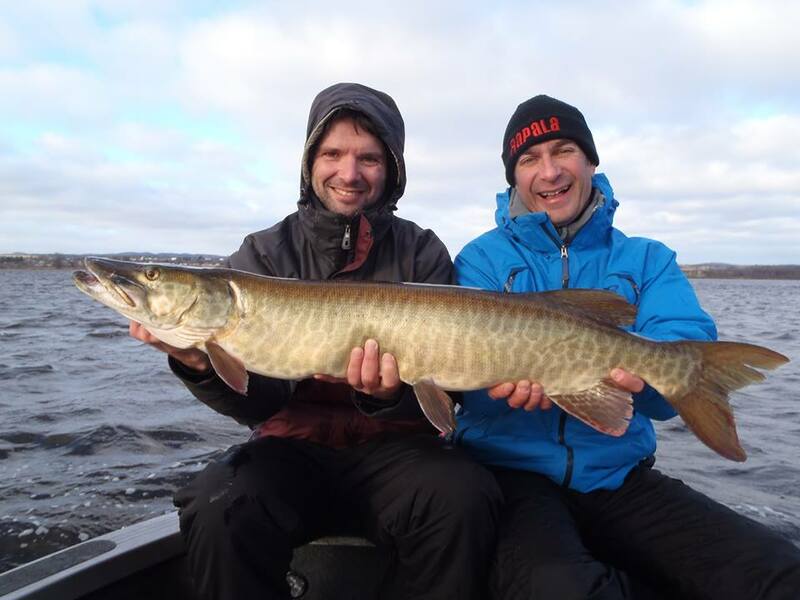 Because in all of this cold and wind we are still catching muskies. Eric and Patrice have been fishing with me for 3 years now. Very pleasant very interesting guys who have caught some nice muskies but have learned all to well about the learning curve involved in casting. Our first trip out we had 8 fish up, 4 on baits and engaged in a fight, and ended up with a zero at the end of the day. After that, they were hooked. Eric finally had his number pulled this week and caught the biggest fish of his life. What a just reward for enduring the elements. Congrats Eric!